The baby is starting to take shape. 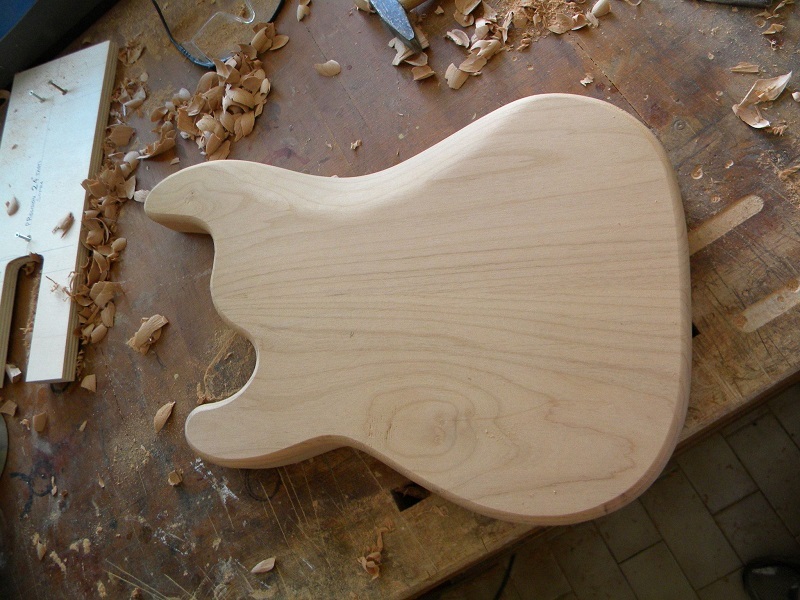 Matteo selected a lovely piece of Alder which will be the tonewood of choice for the body. 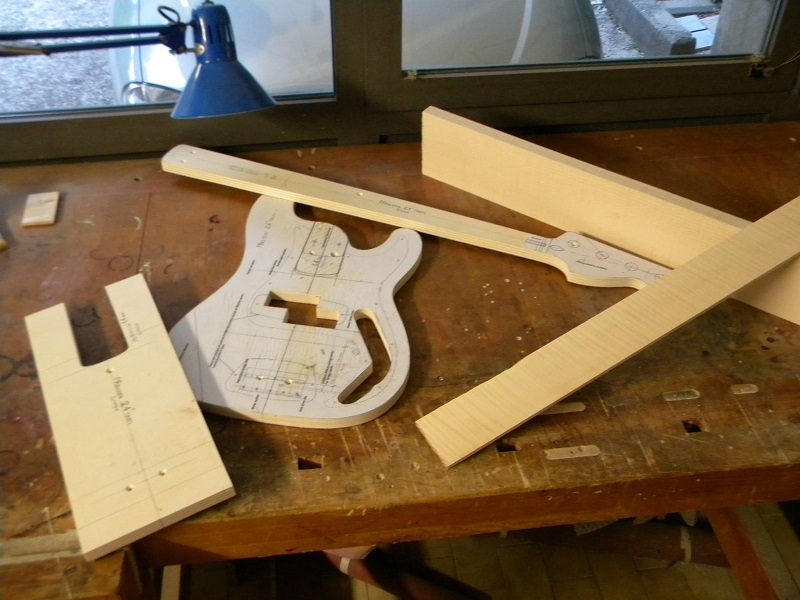 When we spoke about the neck/ body wood combination, he was very clear about the fact that an Alder body was the best choice to complement a maple neck / fretboard. 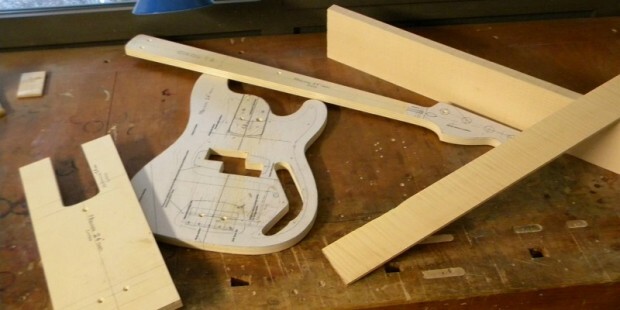 We want to build an instrument that can deliver a warm, vintage tone as well as some modern rock grind. 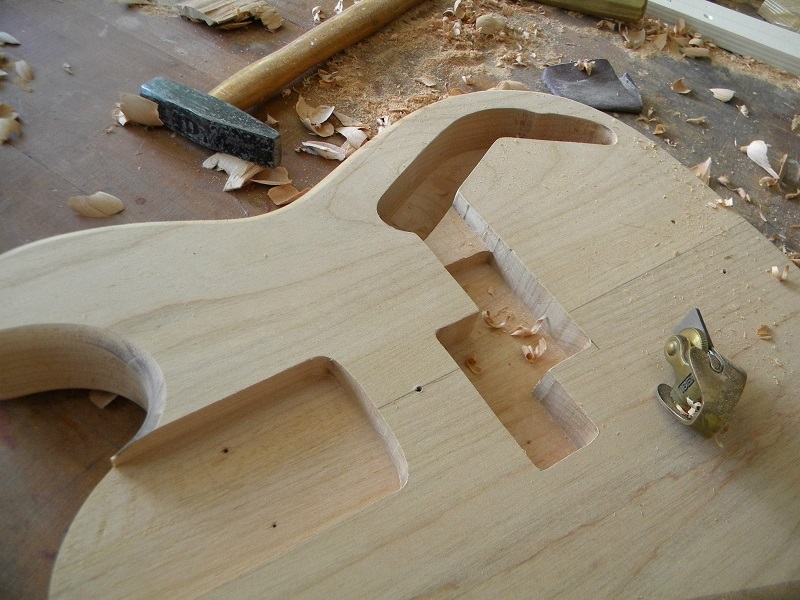 If we went for a harder body wood, say ash, the instrument response would have been too bright / snappy which is great if you’re playing in a rock band or funkying it up, but probably too much of a one trick pony. 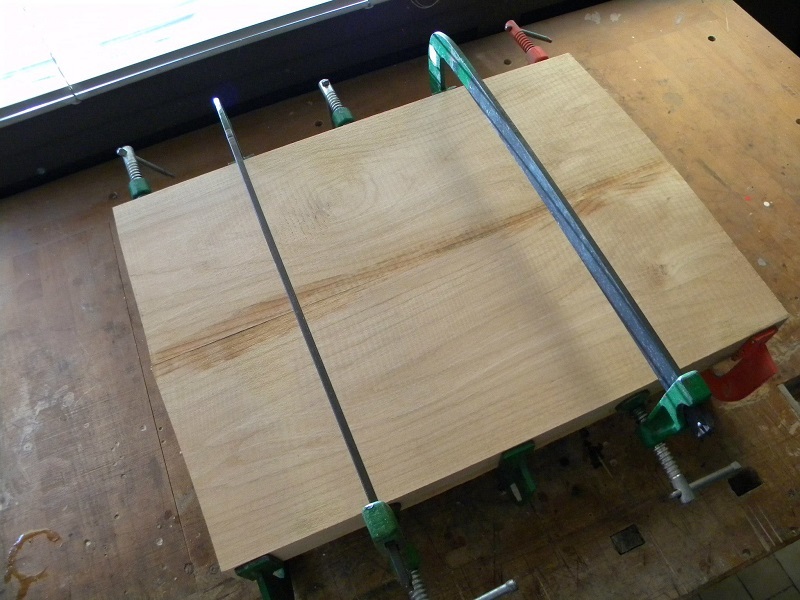 Of course I am sure there’s a million great instruments out there that are made of denser / harder woods and can deliver warm round tones, but building a bass from scratch is a one bullet operation and we did not want to take chances. Once it’s built it’s built and you have to deal with its inherent voice. In a nutshell the concept would be: maple neck and fretboard to give the sound brilliance, attack and percussiveness and alder body to mellow it out and give it sustain and roundness. Of course the woods are selected to maximize grain coherence and wood coupling once the parts are screwed together. 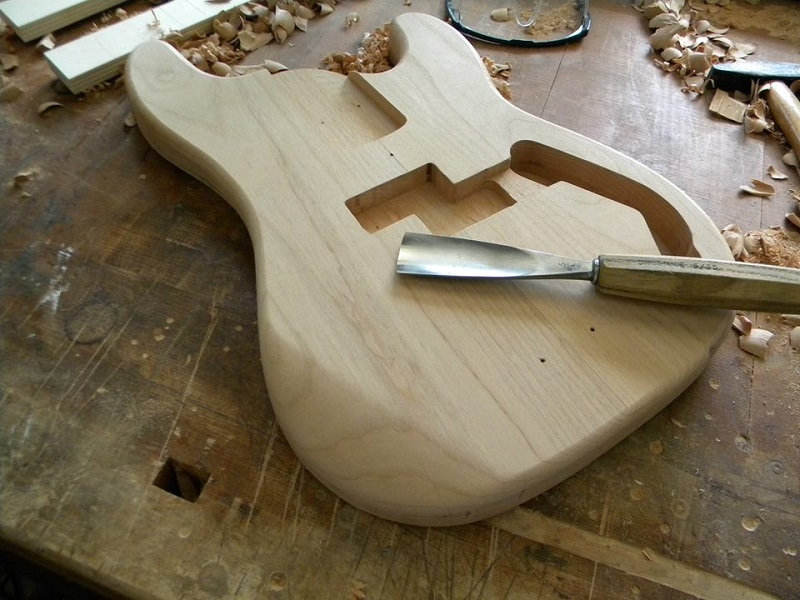 Maestro Rufini then proceeded to hand carve the body to a familiar shape we all know and hopefully love. I had many a conversation with my colleagues about body shape and assumptions. It’s not a mystery that when you walk into a studio or onstage with an instrument that sports a less familiar body shape you can meet suspicion or the people you are working with / for might have a bias towards lesser familiar shapes and curves. I find this particularly true in the UK where Rock and Roll is becoming part of a tradition and MDs and musos have a more positive perception of the classic vintage vibe. Owning an instrument with a quintessential shape gives me more peace of mind that I won’t have to fight producers who want me to “put that away and use my Fender, thanks”. On a different note it’s also true that different instruments give the musician a different mindset, or at least that’s what happens to me. I believe that us electric string players have an almost pagan approach to playing music through our instrument. We need symbols and ‘mojo’. I find myself in a completely different mindset depending on the kind of instrument I got in my hands. Multi – laminate five string oddly shaped active basses scream “TWO HANDED TAP SLAP FUSIONY STUFF” to my subconscious, while classic instruments put me in a more pacate, song oriented mindset. This instrument will be a tradition – inspired beast with hints of modernism; it’ll basically say “groove first, idiot, but sneak in that double thumb lick if you can”. Again, thanks for reading and have a nice one!